On a night trip to Laughlin, my friends and I ate at the Boiler Room Pints Brewery in the Colorado Belle Resort. Although Laughlin is not known for it culinary creativity, I found an interesting item on this brewery's menu. 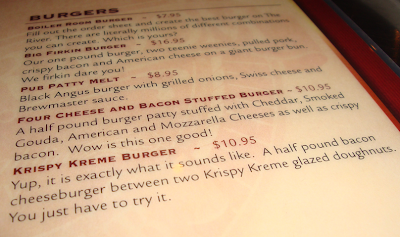 The Krispy Kreme Burger sounded like the best and deadliest burger on the menu! I know for sure my arteries cannot handle this Krispy Kreme Burger! I couldn't even handle a Sausage, Egg & Cheese McGriddles from McDonalds (my heart pumped heavily for an hour after eating it). So that was why I backed out and so did my friends... Oh well maybe I can share the burger with someone next time I go back.